Switzerland, (German: Schweiz, French: Suisse, Italian: Svizzera, Romansh: Svizra), officially Swiss Confederation ("Confoederatio Helvetica" in Latin and when abbreviated: CH), is a landlocked nation of 7.5 million people in Western Europe. Switzerland is bordered by Germany, France, Italy, Austria and Liechtenstein. Switzerland is multilingual—it has three official languages: German, French and Italian, while a fourth national language, Romansh, is official only for communicating with persons of Romansh language. Switzerland is divided into 26 cantons, six of which are sometimes referred to as "half-cantons," since they have less representation in the Council of States. Switzerland has had a long history of being neutral (it has not been in a foreign war since 1815) and therefore hosts various international organizations, such as the United Nations, which, though headquartered in New York City, has many departments in Switzerland. The titles commonly used to name Switzerland in French (Confédération suisse), Italian (Confederazione Svizzera) and Romansh (Confederaziun svizra) translate as "Swiss Confederation," while the German name of Schweizerische Eidgenossenschaft translates literally as "Swiss Oath Fellowship" or "Swiss Commonwealth of the Covenant." It dates its independence to 1291; historically it was a confederation, and it has been a federation since 1848. In 1291, the three forest cantons of Uri, Schwyz, and Unterwalden signed the Federal Charter, uniting them in the struggle against the rule of the Habsburg family which then possessed the Duchy of Austria in the Holy Roman Empire. At the Battle of Morgarten on November 15, 1315, the Swiss defeated the Habsburg army and secured the existence of the Swiss Confederation within the Holy Roman Empire. By 1353, the three original cantons had been joined by the cantons of Glarus and Zug and the city states of Lucerne, Zürich and Berne, forming the "Old Confederacy" of eight states that persisted during much of the fifteenth century and led to a significant increase in the power and wealth of the federation, in particular due to the victories over Charles the Bold of Burgundy during the 1470s, and the success of the Swiss mercenaries. The Swiss victory in the Swabian War against the Swabian League of Holy Roman Emperor Maximilian I in 1499 amounted to de facto independence from the Holy Roman Empire. The expansion of the federation, and the reputation of being invincible which it had acquired during the earlier wars, suffered a first setback in 1515 with a Swiss defeat in the Battle of Marignano. The success of Zwingli's (a Swiss Protestant Reformist) Reformation in some cantons led to inter-cantonal wars in 1529 and 1531 (Kappeler Kriege). Under the Treaty of Westphalia in 1648, European countries recognized Switzerland's independence from the Holy Roman Empire and its neutrality (ancient régime). In Early Modern Switzerland, the conflict between Catholic and Protestant cantons persisted, erupting in further violence at the battles of Villmergen in 1656 and 1712, and the growing authoritarianism of the patrician families, combined with a financial crisis in the wake of the Thirty Years' War, led to the Swiss peasant war of 1653. In 1798, the armies of the French Revolution conquered Switzerland and imposed a new unified constitution. This centralized the government of the country and effectively abolished the cantons. The new regime, known as the Helvetic Republic, was highly unpopular. It had been imposed by a foreign invading army and destroyed centuries of tradition, including the right to worship, and made Switzerland nothing more than a French satellite state. The fierce French suppression of the Nidwalden Revolt in September, 1798, is an example of the brutal way in which the French army responded to the resistance of the local population. When war broke out between France and other countries, Switzerland found itself being invaded by other outside forces from Austria and Russia. In 1803, Napoleon organized a meeting of the leading Swiss politicians from both sides in Paris. The result was the Act of Mediation, which largely restored Swiss autonomy and introduced a Confederation of nineteen cantons. From that time, much of Swiss politics was concerned with balancing the cantons' tradition of self-rule with the need for a central government. In 1815, the Congress of Vienna fully re-established Swiss independence and the European powers agreed to permanently recognize Swiss neutrality. The treaty marked the last time that Switzerland fought in an international conflict. The treaty also allowed Switzerland to increase its territory, with the admission of the cantons of Valais, Neuchâtel and Geneva. The restoration of power to the patriciate was only temporary. After a period of unrest with repeated violent clashes, such as the Züriputsch of 1839, civil war broke out between the Catholic and the Protestant cantons in 1845 (the Sonderbundskrieg). The war lasted for less than a month, causing fewer than 100 casualties; most of which were through friendly fire. However, the Sonderbundskrieg had a major impact on both the psychology and the social fabric of the Swiss and Switzerland, forcing all Swiss to recognize the need for internal unity and strength against their European neighbors. Swiss people of all social levels, Catholics and Protestants, liberals and conservatives, all realized that the cantons would profit more if their economic and religious interest were merged. To appease the Federationalists, who favored the power of the individual cantons (the Sonerbund Kantone), the national assembly was divided among Ständerat (similar to a Senate), and the Nationarat (similar to a House of Commons). Switzerland adopted the use of referenda and a federal constitution in 1848. 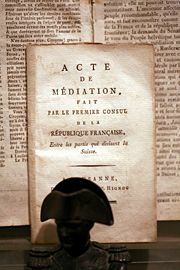 This constitution provided for a central authority, while leaving the cantons the right to self-government on local issues. The constitution was amended extensively in 1874 in order to take into account the rise in population, the Industrial Revolution and the settling of a single currency. It also established federal responsibility for defense, trade, and legal matters. In 1893, the constitution was revised to incorporate unusually strong elements of direct democracy, which remain unique even today. During both World Wars, Switzerland was never invaded. During World War I, Switzerland was home to Vladimir Lenin, who remained there until 1917 In 1920, Switzerland joined the League of Nations, and in 1963, the Council of Europe. During World War II, detailed invasion plans were drawn up by the Germans, but Switzerland was never attacked. Switzerland was able to remain independent through a combination of military deterrence, economic concessions to Germany, and good fortune, as larger events during the war delayed an invasion. Attempts by Switzerland's small Nazi party to bring about an Anschluss with Germany failed miserably. The Swiss press vigorously criticized the Third Reich, often infuriating its leadership. Under General Henri Guisan, a massive mobilization of militia forces was ordered. The Swiss military strategy was changed from one of static defense at the borders, providing protection for the economic heartland, to a strategy of organized long-term attrition and withdrawal to strong, well-stockpiled positions high in the Alps, known as the Réduit. Switzerland was an important base for espionage by both sides in the conflict, and often mediated communications between the Axis and Allied powers. Switzerland's trade was blockaded by both the Allies and by the Axis. Economic cooperation and extension of credit to the Third Reich varied according to the perceived likelihood of invasion, and the availability of other trading partners. Concessions reached their zenith after a crucial rail link through Vichy France was severed in 1942, leaving Switzerland completely surrounded by the Axis. Over the course of the war, Switzerland interned over 300,000 refugees, 104,000 of which were foreign troops, interned according to the Rights and Duties of Neutral Powers outlined in the Hague Conventions. Of these refugees, 60,000 were civilians escaping persecution by the Nazis. Of these, 26,000 to 27,000 were Jews. Women were granted the right to vote in the first Swiss cantons in 1959, at the federal level in 1971, and after resistance, in the last canton Appenzell Innerrhoden in 1990. After achieving suffrage at the federal level women quickly rose in political significance, and the first woman on the seven member High Council, Elisabeth Kopp, served from 1984-1989. The first female president was Ruth Dreifuss, elected in 1998 to become president during 1999. (The Swiss president is elected every year from those among the seven member High Council). The second female president, Micheline Calmy-Rey, originally from the French-speaking western area of canton Valais (Wallis in Swiss German), was elected to the Swiss high office in 2007. A second woman on the seven member cabinet/high council, Doris Leuthard, is from the canton Aargau. In 1979, areas from inside the previous borders in the canton of Bern attained independence from the Bernese, forming the new canton of Jura. On April 18, 1999 the Swiss population and the cantons voted in favor of a completely revized federal constitution. In 2002, Switzerland became a full member of the United Nations, leaving the Vatican as the last widely recognized state without full UN membership. Switzerland is a founding member of the EFTA, but is not a member of the European Economic Area. An application for membership in the European Union was sent in May 1992, but has not advanced since the Swiss rejected the EEA in a referendum on December 1992. Switzerland was the only country to launch a referendum on the EEA. There have since been several referenda on the EU issue, with a mixed reaction to these from the population. However, Swiss law is gradually being adjusted to conform with that of the EU and the government has signed a number of bilateral agreements with the European Union. Switzerland, together with Liechtenstein, has been completely surrounded by the EU since Austria's membership in 1995. On June 5, 2005, Swiss voters agreed by a 55 percent majority to join the Schengen treaty, a result that was regarded by EU commentators as a sign of support by Switzerland, a country that is traditionally perceived as independent, neutral, or isolationist. The Federal Constitution adopted in 1848 is the legal foundation of the Federation. It ensures the rights of individuals and citizen participation in public affairs, divides the powers between the Confederation and the cantons and defines federal jurisdictions. Under the Federal Constitution, there are three main governing bodies: the bicameral parliament (legislative), the Federal Council (executive) and the Federal Court (judicial). The parliament consists of two houses: the Council of States which has 46 representatives (two from each canton and one from each half-canton) who are elected under a system determined by each canton, and the National Council, which consists of 200 members who are elected under a system of proportional representation. Members of both houses serve for four years. When both houses are in joint session, they are known collectively as the United Federal Assembly. Citizens may challenge any law passed by parliament through referenda, and introduce amendments to the federal constitution through initiatives. Under the 1999 Constitution, cantons hold all powers not specifically delegated to the federation. The top executive body and collective Head of State is the Federal Council, a collegial body of seven members. Although the constitution provides that the Assembly elects and supervises the members of the Council for a four-year mandate, the Council and its administration has gradually assumed a pre-eminent role in directing the legislative process as well as executing federal laws. The President of the Confederation is elected from among the seven to assume special representative functions for a one-year term, yet also maintains the role of his cabinet position. From 1959 to December 2003, the four major parties were represented in the Federal Council according to the "magic formula," proportional to their representation in federal parliament: two Christian Democrats (CVP/PDC), two from the Social Democrats (SPS/PSS), two Liberal Democrats (FDP/PRD), and one from the Swiss People's Party (SVP/UDC). This traditional distribution of seats, however, is not enforced by any law, and in the 2003 elections to the Federal Council the CVP/PDC lost their second seat to the SVP/UDC, which became the strongest party in Switzerland's legislative the same year. The function of the Federal Supreme Court is to hear appeals of cantonal courts or the administrative rulings of the federal administration. The judges are elected by the Federal Assembly for six-year terms. Swiss citizens are subject to three legal jurisdictions: the commune, canton and federal levels. The 1848 federal constitution defines a system of direct democracy (sometimes called half-direct democracy since it is complemented by the more commonplace institutions of a parliamentary democracy.) The instruments of Swiss direct democracy at the federal level, known as civil rights (droits civiques, Volksrechte), include the right to submit a constitutional initiative and a referendum, both of which may overturn parliamentary decisions. By calling a federal referendum, a group of citizens may challenge a law that has been passed by Parliament, if they can gather 50,000 signatures against the law within 100 days. If so, a national vote is scheduled in which voters decide by a simple majority whether to accept or reject the law. Eight cantons together can also call a referendum on a federal law. Similarly, the federal constitutional initiative allows citizens to put a constitutional amendment to a national vote, if they can get 100,000 voters to sign the proposed amendment within 18 months. Parliament can complement the proposed amendment with a counter-proposal, with voters being asked to indicate a preference on the ballot, in case both proposals are accepted. Constitutional amendments, whether introduced by initiative or in Parliament, must be accepted by a double majority of both the national popular vote and a majority of the cantonal popular votes. An unusual number of international institutions have their seats in Switzerland, in part due to its policy of neutrality. The Red Cross was founded there in 1863 and still has its institutional center in the country. Switzerland was one of the last countries to join the United Nations, in 2002, even though Geneva is the second biggest center for the United Nations after New York, and was a founding member of the League of Nations. *These cantons are represented by only one councillor in the Council of States. Their populations vary between 15,000 (Appenzell Innerrhoden) and 1,253,500 (Zürich), and their area between 37 km² (Basel-Stadt) and 7,105 km² (Graubünden). The Cantons comprise a total of 2,889 municipalities. Within Switzerland there are two enclaves: Büsingen belongs to Germany, Campione d'Italia belongs to Italy. In a referendum held in the Austrian state of Vorarlberg on May 11, 1919, over 80 percent of those voting supported a proposal that the state should join the Swiss Confederation. However, this was prevented by the opposition of the Austrian Government, the Allies, Swiss liberals, the Swiss-Italians (persons of Swiss nationality who live in Italian Switzerland - see map) and the Romands (Swiss nationals living in the French-speaking regions of Switzerland - see map). 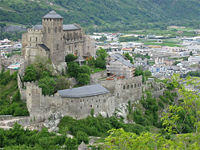 Switzerland allows the Principality of Liechtenstein (62 square miles) to use Swiss currency, maintain a customs union with Switzerland, to be represented abroad by the Swiss government, and to be protected by the Swiss army. With an area of 41,285 square kilometers (15,940 sq mi), Switzerland is a relatively small country. The population is about 7.4 million, resulting in an average population density of 182 people per square kilometer (472/sq mi). However the more mountainous southern half of the country is far more sparsely populated than the northern half, which comprises more hospitable hilly terrain, partly forested and partly cleared, as well as several large lakes. Switzerland comprises three basic topographical areas: the Swiss Alps, the Swiss plateau or "middleland," and the Jura mountains along the northwest border with France. The Alps are a high mountain range running across the central-south of the country. Among the high peaks of the Swiss Alps, the highest of which is the Dufourspitze at 4,634 meters (15,203 ft), are found countless valleys, many with waterfalls and glaciers. From these, the headwaters of several major European rivers such as the Rhine, Rhône, Inn, Aare, and Ticino flow finally into the largest Swiss lakes such as Lake Geneva (Lac Leman), Lake Zürich, Lake Neuchâtel, and Lake Constance. The smaller lakes near the mountains tend to be a brilliant turquoise color, especially in the summer. The most famous mountain is the Matterhorn (4478 m) in Kanton Wallis and Pennine Alps bordering Italy. The highest mountain, the Dufourspitze or Monte Rosa,is very close to the Matterhorn. The section of the Bernese Alps above the deep glacial Lauterbrunnen Valley, containing 72 waterfalls, is also well known for the Jungfrau (4,158 m), Mönch, Eiger group of peaks, and the many picturesque valleys in the region. In the southeast, the long Engadin Valley, encompassing the St Moritz area in canton Graubünden, is also well known and the highest peak here is the Piz Bernina (4,049 m). The northern section and more populous part of the country is called the Middle Land. It has open and hilly landscapes, partly forested, partly open meadow, usually with grazing herds, or fields of vegetables and fruit trees, but it can still be somewhat mountainous. Large lakes and the biggest Swiss cities are located in this area of the country. This section, particularly the west, is also referred to as the "Seeland" (the land of lakes); the largest lake is Lake Geneva (Lac Léman in French), at the westernmost edge of Switzerland. The Rhone River is the main tributary to Lac Léman. The Swiss climate is generally temperate, but can vary greatly between localities, from glacial conditions on the mountain tops to the often pleasant Mediterranean climate at Switzerland's southern tip. Summer tends to be warm and humid at times, with periodic rain, so it is ideal for pastures and grazing. The winters in the mountains alternate sun with snow, while the lower lands tend to be more cloudy and foggy in winter. A weather phenomenon known as the Föhn can occur at all times of the year, even in winter, and is characterized by a wind with warm Mediterranean air. The driest conditions persist in the southern valleys of the Wallis/Valais, above which valuable saffron is harvested and many grapes are grown. 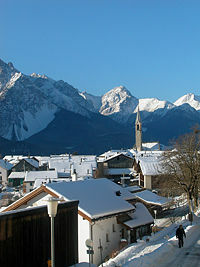 Graubünden also tends to be drier in climate and slightly colder, yet with plentiful snow in winter. The wettest conditions persist in the high Alps and in the Ticino, which has much sun with heavy bursts of rain from time to time. The east tends to be colder than the west of Switzerland, yet any place high in the mountains can experience a cold spell at any time of the year. Precipitation tends to be spread moderately throughout the year, with minor variations across the seasons depending on locale. Autumn frequently tends to be the driest season, yet the weather patterns in Switzerland can be highly variable from year to year, and are very difficult to predict. Switzerland's eco-systems are particularly vulnerable, due to the many delicate valleys separated by high mountains, often forming unique ecologies. The mountainous regions, which host a rich variety of plants not found at other altitudes, are under pressure from visitors and grazing. The treeline in the mountains of Switzerland has retreated downwards 1000 ft over the years, largely due to herding and grazing pressures. Switzerland has a prosperous and stable modern market economy, with a nominal per capita GDP that is higher than those of the big western European economies, United States and Japan, though on a PPP basis, it ranks tenth. The World Economic Forum's Global Competitiveness Report currently ranks Switzerland's economy as the most competitive in the world. For much of the twentieth century, Switzerland was the wealthiest country in Europe by a considerable margin. However, since the early 1990s it has suffered from slow growth and, in 2005, fell to fourth among European countries with populations above one million in terms of nominal Gross Domestic Product per capita, behind Ireland, Denmark and Norway; and to the tenth position in terms of Gross Domestic Product per capita at purchasing power parity (also behind the European countries Austria and Iceland; (see list). Switzerland is a member of the European Free Trade Association. Banking, tourism, pharmaceuticals, and chemicals are very important industries in Switzerland. The manufacture of precision instruments for engineering, watchmaking, and the biological sciences industries also enjoy prominence in the Swiss economy. The many international organizations in Switzerland contribute to the Swiss economy and labor market. In recent years, the Swiss have brought their economic practices largely into conformity with those of the European Union in many ways, in an effort to enhance their international competitiveness. The economy has been growing most recently at around 3 percent per year. Full EU membership is a long-term objective of some in the Swiss government, but there is considerable popular sentiment against this, supported by the conservative SVP party. The western French-speaking areas tend to be more pro-EU. The government has established an Integration Office under the Department of Foreign and Economic Affairs. To minimize the negative consequences of Switzerland's isolation from the rest of Europe, Bern and Brussels signed seven agreements, called bilateral agreements, to further liberalize trade ties. These agreements were signed in 1999 and took effect in 2001. This first series of bilateral agreements included the free movement of persons. A second series covering nine areas was signed in 2004 and awaits ratification. The second series includes the Schengen treaty and the Dublin Convention. The Swiss government continues to discuss further areas for cooperation. Switzerland most recently (2006) approved a billion euro supportative investment in the poorer eastern European countries, to enhance cooperation with the EU. Switzerland has also been under EU, and sometimes international, pressure to change its policy on bank secrecy and to raise tax rates in compliance with the EU. Preparatory discussions are being opened on four new areas: opening up the electricity market, participation in the European GPS system Galileo, cooperating with the European Center for Disease Prevention, and recognizing certificates of origin for food products. Since Switzerland voted against membership in the European Economic Area in December 1992, it has maintained and developed its relationships with the European Union and European countries through bilateral agreements. Any internal debate on the subject has been suspended since March 2001, when the Swiss people refused in a popular vote to start accession negotiations with the EU. Both Switzerland and Norway have consistently voted against EU membership, although the votes have been very close. Distrust of centralized bureaucracy has motivated the Swiss to remain in the European Free Trade Association (EFTA), though they acquired a special arrangement with the European Community in 1972. However, after the removal of barriers to the movement of people, goods, and services in the European Community (EC) in 1992, EFTA negotiated with the EC, creating a trade bloc of nineteen nations, the European Economic Area, that will ultimately result in Swiss membership in the EC. In accordance with Switzerland’s policy of neutrality, which became international law in 1815, the Swiss army serves solely to preserve the independence of the country. Under a system of universal conscription, every Swiss male is required to perform military duty between the ages of 20 and 50, or, for officers, 22 and 55. Recruits participate in an initial training program, followed by eight annual three-week refresher courses and later by shorter supplementary courses. Swiss women may serve as volunteers in the women's auxiliary force. A Swiss soldier keeps his equipment, including arms and ammunition, at home, and performs his obligatory gunnery duty each year in civilian clothes. In a referendum held in November, 1989, more than one-third of the electorate, mainly the young population and a majority in the cantons of Jura and Geneva, voted to do away with the Swiss army. Switzerland is heavily active in recycling and anti-littering bans and is one of the top recyclers in the world, with roughly 98 percent of all recyclable items being recycled. In many parts of Switzerland, householders are charged for garbage disposal and garbage will only be collected if it is in bags which either have a payment sticker attached, or in official bags on which a surcharge is paid when the bags are purchased. Since recycling is free, this gives a financial incentive to recycle as much as possible, Swiss health officials and police often open up garbage for which the disposal charge has not been paid and enforce fines for nonpayment of the disposal fee. Fines for not paying the disposal fee range from 200-500 Swiss Francs ($165-$410 at April 2007 exchange rates). The history of Switzerland has been shaped by Etruscans, Rhaetians, Celts, Romans, and Germanic peoples. The present population shows traces mainly of the Alpine, “Nordic,” and southern Slav or Dinaric peoples. In order to protect their neutrality and survive, the disparate ethnic elements in Switzerland have learned to cooperate. 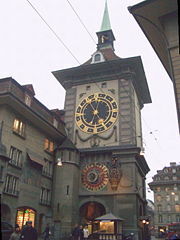 Traditionally, Swiss society and politics has been shaped largely by economic and political necessity. Through education and the efficient use of manpower, Switzerland has been transformed a predominantly mountainous, rural, and landlocked country with limited natural resources into one of the most diversified and important industrial and commercial nations in the world. Switzerland lies at the crossroads of several major European cultures that have heavily influenced the country's languages and culture. 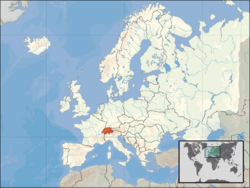 Switzerland has four official languages: German (64 percent) in the north and center; French (20.4 percent) to the west; Italian (6.5 percent) in the south; and Romansh (a Romance language), that is spoken locally by a small minority (< 0.5 percent) in the southeastern canton of Graubünden. (Some dialects of Franco-Provençal have speakers in rural communities in the region where French is spoken. This language has no legal status). The federal government is obliged to communicate in the four official languages. In the federal parliament, German, French, Italian and Romansh are the official languages and simultaneous translation is provided. The German spoken in Switzerland is predominantly a group of dialects collectively known as Swiss German, but written communication and broadcasts typically use Swiss Standard German. Similarly, there are some dialects in the other speaking part of Switzerland, called Swiss French and Ticinese (a dialect of Lombard). Also the official languages (German, French and Italian) borrow some terms not understood outside of Switzerland, i.e., terms from other languages (German Billette from French), from similar term in another language (Italian azione used not as act but as discount from German Aktion). Learning one of the other national languages at school is obligatory for all Swiss, so most Swiss are supposed to be at least bilingual (in reality, many Swiss are more fluent in English than in their own country's other languages, particularly the German-speaking Swiss). Resident foreigners and temporary foreign workers make up about 21 percent of the population. Most of these are from European Union countries, with smaller numbers from the rest of the world, including refugees from the former Yugoslavia (5 percent) and Turks (1 percent). Recently, there has been an increase in the populations of Hmong, Lao and Vietnamese people, and also immigrants from Mexico and South America. Cathedral Notre-Dame of Lausanne in the French speaking west. Switzerland has no country-wide state religion, though most of the cantons (except for Geneva and Neuchâtel) recognize official churches, in all cases including the Catholic Church and the Swiss Reformed Church, in some cantons also the Old Catholic Church and Jewish congregations. These churches are financed by official taxation of adherents. Christianity is the predominant religion of Switzerland, divided between the Catholic Church (41.8 percent of the population) and various Protestant denominations (40 percent). Immigration has brought Islam (4.3 percent) and Eastern Orthodoxy (1.8 percent) as sizable minority religions. The 2005 Eurobarometer poll found 48 percent to be theist, 39 percent expressing belief in "a spirit or life force," 9 percent atheist and 4 percent agnostic. Historically, the country has been evenly balanced between Catholic and Protestant, with a complex patchwork of majorities over most of the country. 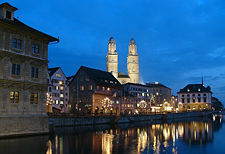 The larger cities (Bern, Zürich and Basel) are predominantly Protestant. Central Switzerland, as well as the Ticino, is traditionally Catholic. The Swiss constitution of 1848, created under the recent impression of the clashes between Catholic and Protestant cantons that culminated in the Sonderbundskrieg, consciously defined a consociational state, allowing the peaceful co-existence of Catholics and Protestants. A 1980 initiative calling for the complete separation of church and state was clearly rejected, with only 21.1 percent voting in support. The culture of Switzerland is influenced by its neighbors and its international sentiment, but over the years a distinctive culture with some regional differences and an independent character has developed. Each region is somewhat culturally connected to the neighboring country that shares its language. French-speaking regions have tended to orient themselves slightly more towards French culture, and are more supportive of the EU. Swiss German-speaking areas show a greater influence of German culture and tend to be conservative and neutral. Italian-speaking areas are influenced by Italian culture. The linguistically isolated Rhaeto-Romanic culture in the eastern mountains of Switzerland is also robust and strives to maintain its very rare linguistic tradition. In the mountainous areas there is a great deal of enthusiasm for outdoor sports, particularly skiing in winter, and hiking and mountaineering during the summer. Some areas are oriented towards the tourists who visit year-round, with quieter seasons in the spring and autumn when there are fewer visitors and a higher ratio of Swiss. 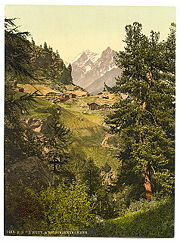 A traditional farmer and herder culture also predominates in many areas, and this connection to the land and agriculture is shared by all the Swiss. Though most Swiss no longer actually farm themselves, small farms are omnipresent outside the cities, and many Swiss at least cultivate a small garden plot or window boxes with geraniums and other flowers. A predominant cultural characteristic in Switzerland is responsibility, safety, and respect for the rule of law; people are even hesitant to cross the street unless the walk sign is green. Switzerland has traditionally had a very low rate and reputation for crime, though many Swiss are concerned that the crime rates have been slightly increasing with the large influxes of immigrants. Although crime rates in Switzerland are among the lowest in the world, there is some organized crime. The Swiss are well known for their affinity for cleanliness and punctuality, which is often the subject of jokes. Switzerland possesses one of the best road and public transportation networks in the world. Like many European nations, the Swiss are enthusiastic fans of football (soccer) and the national team or 'Nati' is widely supported. Swiss wrestling or "Schwingen" is an old tradition from the rural central cantons and considered the national sport. Hornussen is another indigenous Swiss sport, which is like a cross between baseball and golf. Steinstossen is the Swiss variant of stone put, a competition in throwing a heavy stone. Practiced among the alpine population since prehistoric times, it is recorded to have taken place in Basel in the thirteenth century. It is also central to the Unspunnenfest, first held in 1805, with its symbol the 83.5 kg Unspunnenstein. Floorball is a new sport in Switzerland that grows every year in popularity. A main factor is the professional league called Nationalliga A that draws many famous players from other countries. Over the last few years several Swiss tennis players, like Roger Federer and Martina Hingis, have been multiple Grand Slam singles champions. One of the world's best current ice skaters is Swiss Stéphane Lambiel. Many Swiss also follow hockey and support one of the 12 clubs in the League A. Two clubs are from the French-speaking Switzerland, and two other from the Italian-speaking area. The canton Graubünden has its own club, HC Davos, which won the 2006–2007 Swiss championship. The German speaking part of Switzerland has seven clubs. Switzerland is also the home of the successful sailing team Alinghi. Other sports where the Swiss have been successful include fencing (Marcel Fischer), whitewater slalom (Ronnie Dürrenmatt – canoe, Mathias Röthenmund – kayak), ice hockey (Swiss National League), beach volleyball (Sascha Heyer, Markus Egger, Paul and Martin Laciga), and skiing (Bernhard Russi, Pirmin Zurbriggen, Didier Cuche). ↑ Traditional. The Federal Charter mentions only "early August" and the treaty is a renewal of an older one, now lost. ↑ Population size and population composition. Swiss Federal Statistical Office. Swiss Federal Statistical Office, Neuchâtel (2010). Retrieved October 25, 2011. ↑ 6.0 6.1 6.2 6.3 Switzerland. International Monetary Fund. Retrieved October 25, 2011. ↑ Klaus Urner. Let's Swallow Switzerland. (Lexington Books, 2002). ↑ The Bergier Commission Final Report, page 117, ICE. Retrieved December 14, 2007. ↑ admin.ch - Political System. Retrieved December 14, 2007. ↑ A majority of 23 cantonal votes, because the result of the popular vote in the six traditional half-cantons each counts as half the vote of one of the other cantons. ↑ unige.ch - Direct democracy in the world, Retrieved December 14, 2007. ↑ A zoomable map of Switzerland is available at either Swiss info GEO or Swiss GEO; a zoomable satellite picture is at map.search.ch. Retrieved December 14, 2007. ↑ World Economic Forum - Global Competitiveness Report, the Global Competitiveness Network. Retrieved December 14, 2007. ↑ Recycling around the world Gebinde, BBC News. 25 June 2005. Last accessed 24 April 2006. ↑ Gebinde. Retrieved December 14, 2007. ↑ SBB: Billette - OnlineTicket. Retrieved December 14, 2007. ↑ Switzerland, state.gov. Retrieved December 14, 2007. ↑ Switzerland, CIA World Factbook. Retrieved December 14, 2007. ↑ Hamilton decides to leave Britain, BBC News. Retrieved December 14, 2007. 1990s. Frommer's Switzerland. New York: Macmillan Travel. 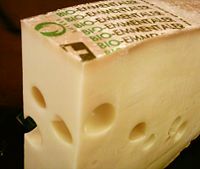 2002-. Historical Dictionary of Switzerland Published electronically and in print simultaneously in three national languages of Switzerland. All links retrieved November 9, 2015. The Federal Authorities of the Swiss Confederation. Maps from the Federal Office of Topography. Swiss Statistics, official website of the Swiss Federal Statistical Office. CIA World Factbook - Switzerland. History of Switzerland: Primary Documents. Historical Dictionary of Switzerland in German, French and Italian. Le Temps, a Swiss daily newspaper in French. Corriere Del Ticino, a Swiss daily newspaper in Italian. swissinfo - News + Infos in 9 languages. My Switzerland, a national tourism organization. Switzerland: Pictures and Travel Information. This page was last modified on 9 November 2015, at 15:19.